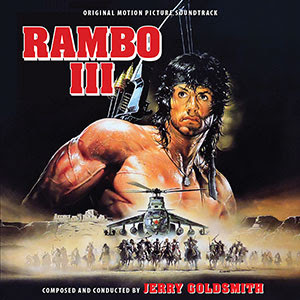 Intrada has given one of its long-standing catalog titles a refresh in this latest edition of Jerry Goldsmith's 1988 score to Rambo III. With this title back in the catalog, Intrada now has the complete Rambo trilogy in print. For this newly re-edited and remastered 30th Anniversary release, Intrada accessed Mike Ross-Trevor’s multi-track mixes made from the original scoring session masters. The sequencing of the previous releases was altered from that of the picture in some instances for purely musical purposes and has served listeners well for nearly three decades. 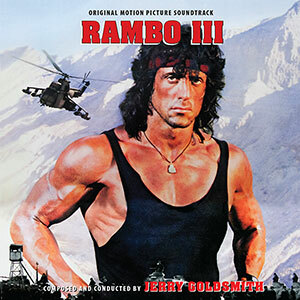 This all-new presentation offers everything Jerry Goldsmith recorded for Rambo III during March and April of 1988 but now in the sequence he originally intended for the film. In the film, the 1979 – 1989 Soviet invasion of Afghanistan becomes the broader story, with Rambo’s daring rescue of a captured Col. Trautman (Richard Crenna) the major story arc. The largely Islamic jihadists fighting the recently established leftist government – now making ties with the Soviets—were portrayed as sympathetic freedom fighters and were in fact historically given support by the United States. In response, Jerry Goldsmith fashioned his most haunting and emotional new material for them. He wrote what is possibly the largest number of separate themes for a single score of his career, resulting in a musical architecture that distinguishes the score for Rambo III from its predecessors, lending the score a shape characteristic of a small group of Goldsmith film scores, including The Sand Pebbles and The Challenge.